PowerPoint handouts are a great resource to distribute to your audience so that they can follow along during your presentation or use for future reference. 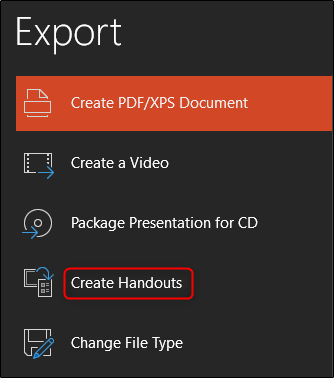 If you’d like to customize the handout layout before its distribution, PowerPoint has a way. 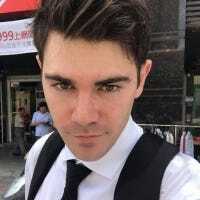 Go ahead and open up the PowerPoint presentation you’ll be working with if you haven’t already. Switch over to the “View” tab and click the “Handout Master” button. This action opens a new “Handout Master” tab on the Ribbon. Here you’ll find several available options for customizing the PowerPoint’s handout, such as Page Setup, Placeholders, Edit Theme, and Background. Let’s first look at the options available in the “Page Setup” group, starting with “Handout Orientation.” By default, the orientation is set to “Portrait,” but you can change it to “Landscape” from the drop-down menu. 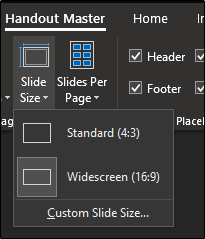 “Slide Size” gives you three options: Standard (4:3), Widescreen (16:9), or Custom Slide Size. Selecting “Custom Slide Size” lets you specify the exact width and height of the slides. “Slides Per Page,” as the name suggests, lets you select how many slides appear on each page, ranging anywhere from one to nine slides per page. Moving on to the “Placeholders” group, you can select or deselect the specific placeholders you want to appear on the handout. Placeholders include the header, footer, date, and page number. To edit the content within these placeholders, make sure the option is enabled and then click the space to start editing. Finally, you can edit the fonts, effects, background style, and color scheme of the handout by using the tools in the “Background” group. Once you’re finished customizing the layout of your handout, click the “Close Master View” button. Be sure to save before closing PowerPoint. 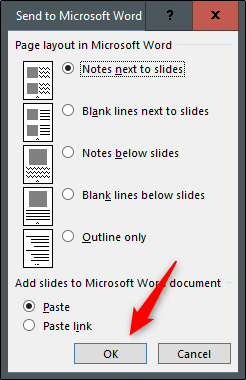 To export the PowerPoint presentation to a Word Document to create handouts, first select the “File” tab. Next, select “Export” in the menu options on the left-hand side. Finally, click the “Create Handouts” button. Once you’ve selected “OK,” your presentation handout will open up in Word. To edit the content within the slides, double-click the slide to be edited. Selecting the area next to the slide allows you to enter notes about the slide. Feel free to add a header or footer to the handout. Once you’re finished, be sure to save the document and print out however many handouts you think you’ll need plus a few more just in case!